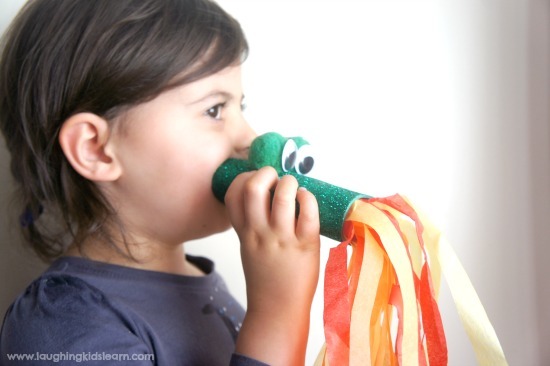 Do you know how to make a fire breathing dragon using a cardboard toilet roll? 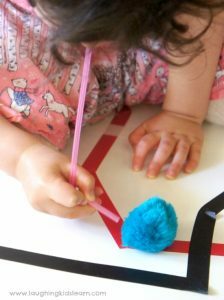 They are seriously very easy for children to make and wonderful way to help children develop their oral motor skills. This adorable handmade toy will have kids playing and engaging in pretend play and would be suitable to make with kids for Chinese New Year. 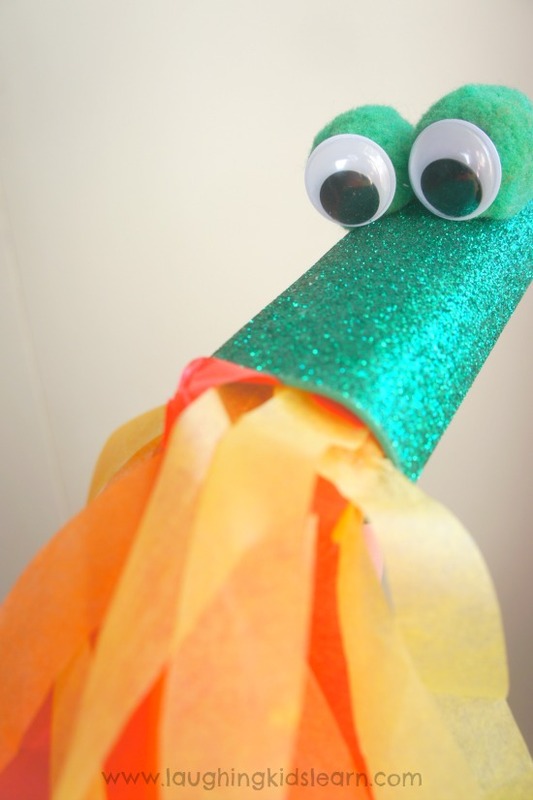 Children will not be able to resist making and blowing through this fire breathing dragon. If you’re a subscriber to my blog I’m sure you are aware of my passion for simple homemade toys. I always feel there is something very rewarding about making a toy for a child or having them make it and experience the joy of playing with it afterwards. 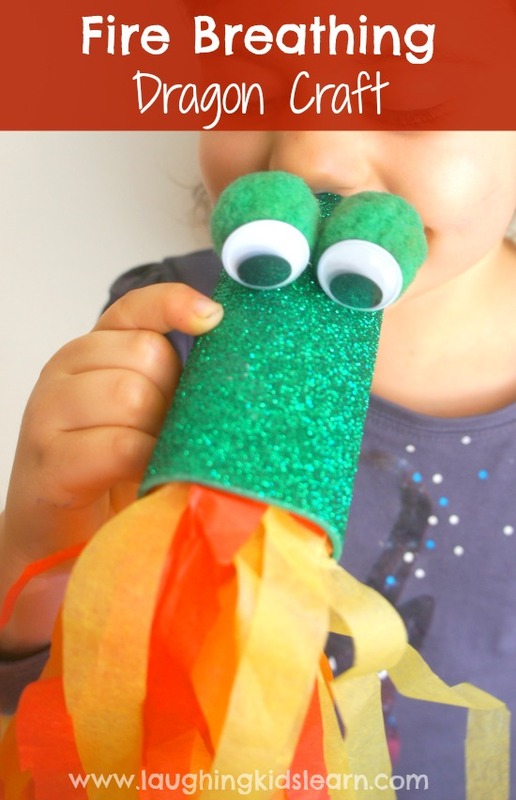 With that in mind, I’m so excited to share with you this adorable little craft and teach you how to make a fire breathing dragon using a cardboard toilet roll. 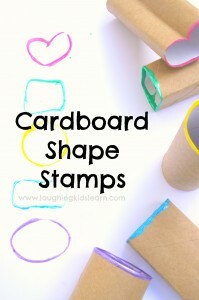 It’s super simple and lots of fun for kids. 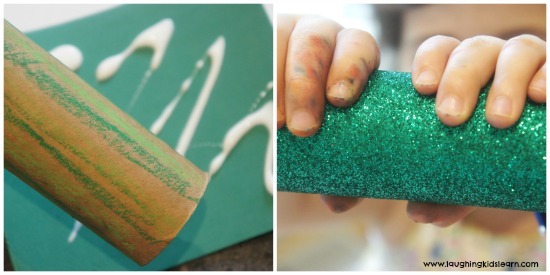 Depending on how much time you have for things to dry, you might like to have your child decorate a toilet roll cardboard tube with coloured pencils or crayons (above left). Otherwise, you might like to cover the tube in some coloured paper (above right). While the coloured paper was drying we went about making the fire for our fire breathing dragon. 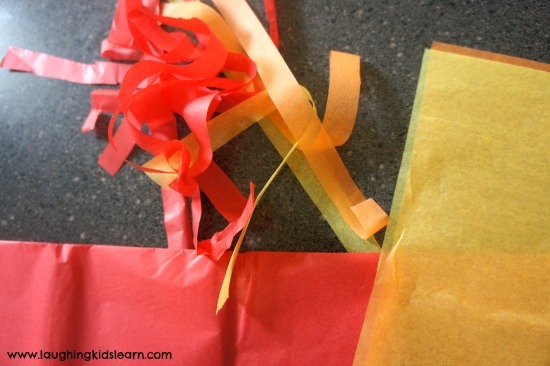 I collected some tissue paper in red, yellow and orange and had Possum (aged 4 years) to use her fine motors skills and tear it up into long strips. Each strip was probably about 20cm long. Have you ever torn tissue paper? It’s actually a little harder than tearing regular paper as it’ much thinner and requires a little more effort to keep it from breaking short. It’s a really great challenge, especially for older children. Laying out one long strip of masking tape with the sticky side up, I had Possum press and stick the ends of the colour tissue paper strips to it. Do you know much about oral motor development? It is developing the muscles of the lips, cheeks, tongue, hard and soft pallet of the face. These muscles are used when children blow bubbles, drink through a straw and more. I’m not an occupational therapist, but it came to my attention recently that children in fact need to develop oral motor skills as much as fine motor skills. It helps their language development and ability to do simple tasks that many of us would not even question. 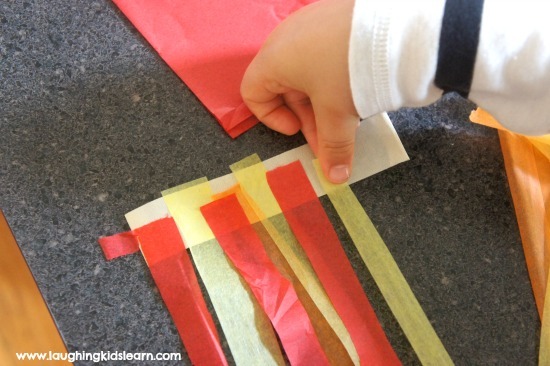 Once we had layered the sticky tape with the strips of coloured tissue paper I curled the masking tape and created a tube so that air could pass through it when it was blown. I then added some glue to the inside of the toilet roll and placed the ‘fire’ just inside one end. 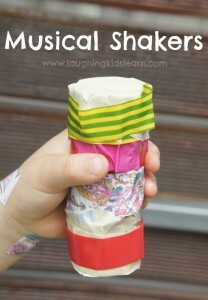 You might also like to add additional masking tape to the inside of the roll for extra support. Using a few dabs of glue we attached two pompoms for the eyes. I’ve also seen others add extra pompoms for the nostrils too, which looks cute. Possum and I decided to just use the pompoms for the eyes. And as the final step, simply add some large googly eyes and you’re done! What an adorable fire breathing dragon craft. It’s so simple, fun to make and play with. Of course there are many, many benefits to encouraging children to use toys that require blowing. The facts are that children who develop blowing skills have a greater sensory awareness around their mouth which can mean they have better control over regulating their breathing, improvement language skills and muscle tone and endurance. 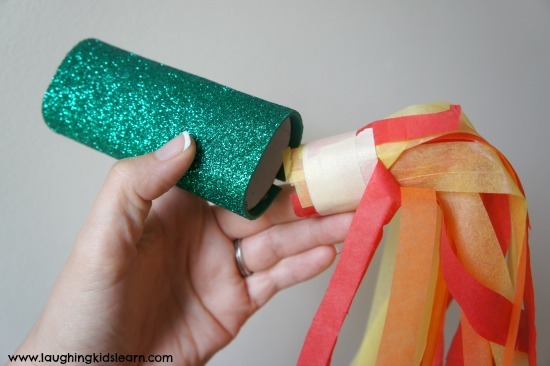 Aside from all the amazing developmental benefits to getting children to use toys that require them to blow, this is such an adorable craft that children will love making and playing with. 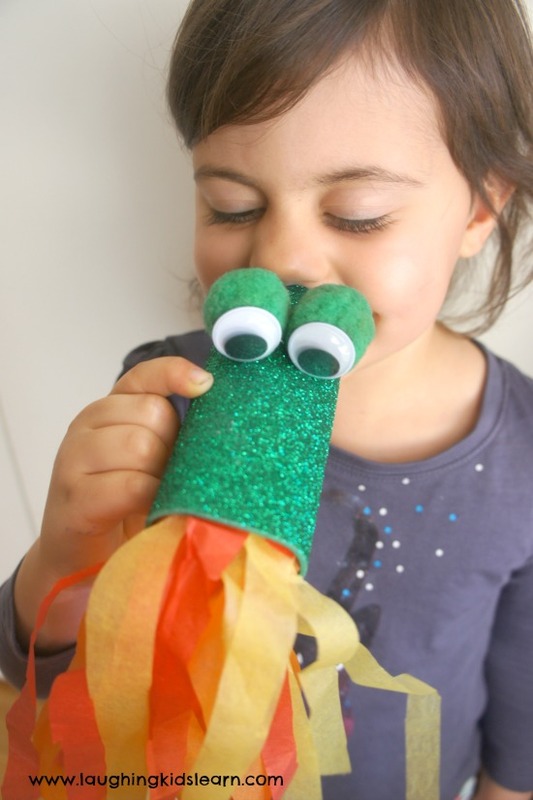 Once you know how to make a fire breathing dragon using a cardboard toilet roll you can adjust it to create whatever animal or mythical creature your child likes! 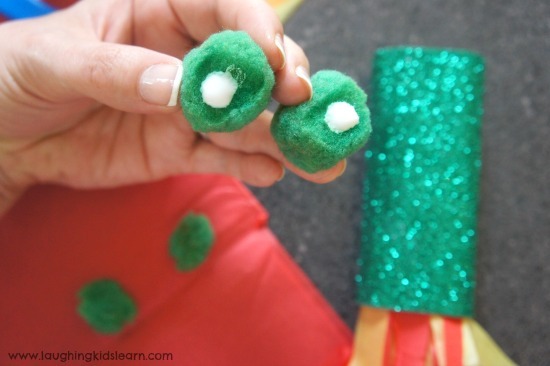 Of course the fire breathing dragon could be fun to make around Chinese New Year. What other animals or mythical creatures can you think to make? This is so cute! I can’t wait to do things like this with little Will! Just you make sure you’re still blogging on this fab website in a few years!!!!! Otherwise I’ll be totally lost! Thank you Kelly. I appreciate your kind comments. Awesome ideas on your site Kate! These would be great when a child needs to relax and take a deep breath. Of course they would each have their own. Thanks for a great idea. Viv you’re a genius. What a fantastic idea!!! I think this could certainly benefit a child who needs some relaxation time. Much appreciate your comment. Have a lovely end to your week.